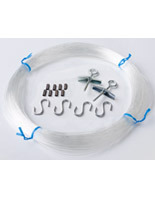 This Professional Sign Supply With Wire Is Practically Invisible! This Sign Supply Keeps the Focus on Your Company Advertisement! 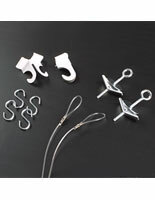 SignSupplies2Go.com Has Variations For Sale! This commercial sign supply that displays posters gives you not only a ceiling installation, but one with transparent suspension material! 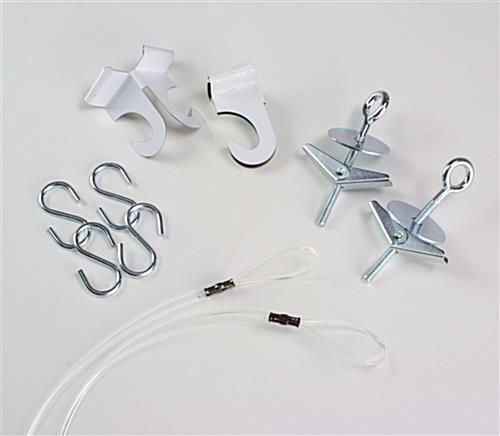 For suspended ceilings, you can use the kit's hanger clips, and for sheetrock or plaster and lath ceilings, toggle bolts are included. 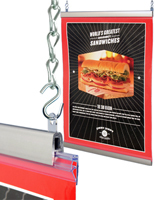 This sign supply, poster hanging package offers another advertising method besides cheap plastic or heavy metal wall frames. With this ceiling-mount kit, your menus or graphics will be simple to hang and change out, and they'll produce high-visibility marketing impact! Ceiling-mounted promotions are gaining favor with advertisers, who recognize them as more eye-catching than framed wall displays. Besides, suspending your graphics from above gives you additional floor and wall space for other signs or posters. 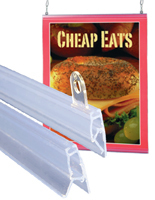 From big department stores to upscale food markets, companies find this sign supply kit ideal for announcing new merchandise, or as way to inform customers of special sales events or the store's layout. 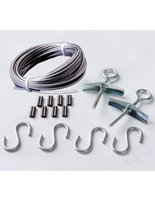 Our company also offers kits with longer nylon lines, if your space has higher ceilings.